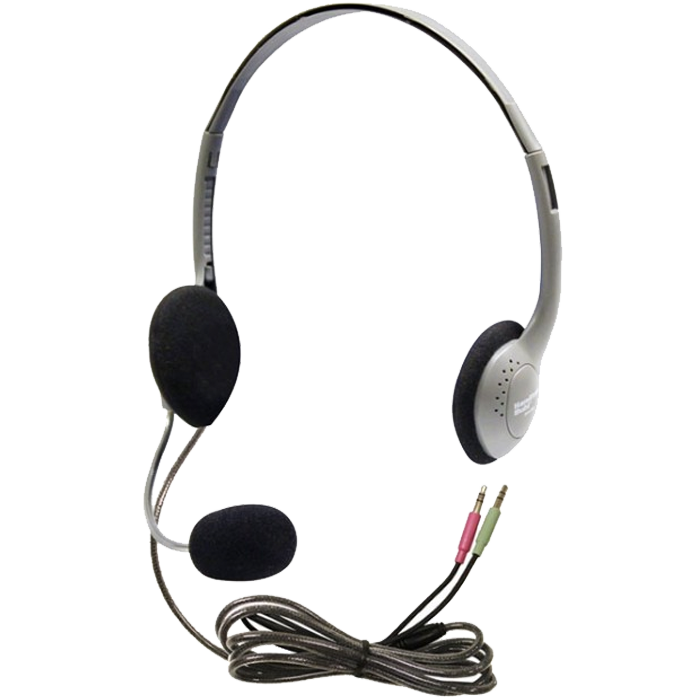 HamiltonBuhl HA2M Headset - Headsets Direct, Inc. The HamiltonBuhl HA2M Dual-Ear Headset is a very lightweight, budget-friendly headset made for classrooms and computer labs. The headset is a headband over the head with speakers on both ears. The HA2M personal multimedia headset has a gooseneck microphone that is very bendable and flexible, so you can get good mic positioning, so the student’s voices will be clear and accurate. The headband is adjustable, so easy to fit for different head sizes. The wearing style is considered on ear, which means that the ear cushions, or ear cups, rest against the ears, they don’t go around the ears. This is made for an average-to-quieter environment. The HamiltonBuhl HA2M headset comes with a five-foot long Dura-Cord. This is HamiltonBuhl’s patented cord. It’s chew and kink resistant. It’s made of braided nylon in a PVC sleeve, so very durable, yet very flexible. This particular headset terminates in two 3.5 millimeter plugs. This is the most important part of choosing headphones and headsets, finding the right plug for your device. The type of plug on this headset is for older PC’s where you have a soundboard. They have the speaker on one plug and the microphone on the other plug. Please give us a call if you have any questions on compatibility. The HamiltonBuhl HA2M headset gives you both speaker and googseneck mic capabilities. It also includes a heavy-duty storage bag. You can write students names on the bag to keep things organized. The storage bag also acts as an anti-lice bag; put the headset in there, and within 24 – 48 hours, it kills the lice without chemicals. Again, this is the HamiltonBuhl HA2M headset. If you have any questions on this or any other headsets, please give us a call at Headsets Direct 1-800-914-7996, or visit us online at www.headsetsdirect.com.